Ford's 100 years in photos 10/52 | What Car? 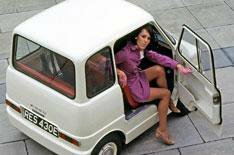 This week's picture comes from 1967, when Ford unveiled this all-electric Comuta at the Geneva motor show. The tiny four-seater had a top speed of 40mph and a range of 40 miles. It's taken a while, but Ford is now preparing to launch an all-electric production version of the Focus in 2012. Click here to see last week's picture of a 100 four-seater family car.